One of the minimal rules that will be enforced is attacking the serve. Throughout all levels from high school to professional, you cannot block or attack the serve while standing in first 10 feet from the net on the court. So any player standing within 10 feet of the net cannot send the ball back over on the first shot through an attacking or blocking motion. If they do this, the play will be considered dead and a point awarded to the serving team. How do you clarify “attacking” or “blocking” the serve for the growler? The easiest way we can come up with is if you leave your feet to hit the ball. As long as you don’t leave your feet, a front row player may pass the ball back over the net. One of the potential issues that caused a little bit of confusion last year is proper rotation. We want to clear up the confusion as much as possible in order to keep it simple and keep the game moving quickly. We also want to prevent an illegal substitution at a critical point of play. Below is a diagram of the two acceptable ways to rotate. The first is the standard volleyball way to rotate (as shown with yellow dots). You rotate in at the server position and keep the same order of players consistently. Once you start in that order you have to keep that same order throughout the entire match. You also cannot switch to two rotating spots mid-game. 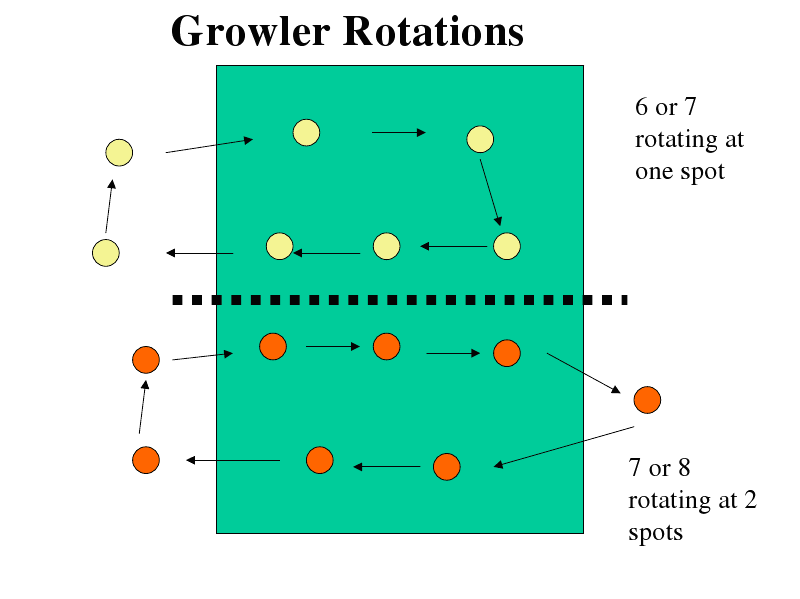 The second way to rotate (orange dots) is to keep the players from sitting through 3 – 5 rotation spots in a row if you have 8 – 10 players. You can rotate in at two spots as long as you follow the same pattern at all times and you cannot switch back to one rotation spot until the next match.